Single out and retrieve idle ESRI licenses by saving and closing idle sessions. Manage the consumption of ESRI licensed extensions. Set the licensing level according to the number of available licenses. 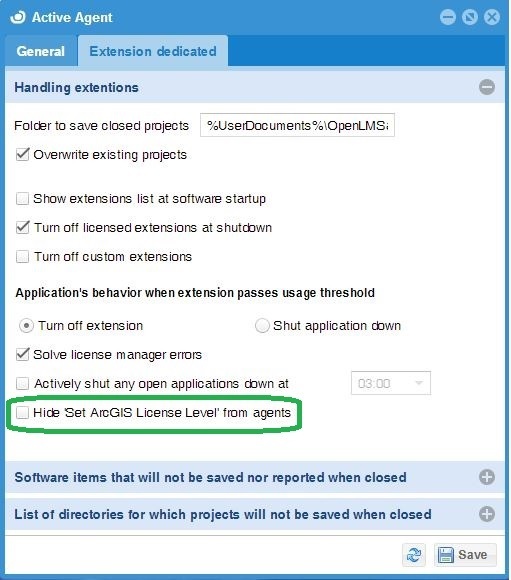 Choose whether to save the ArcGIS licensing level to the Registry, to do it on a user level, or on a system level (for all users – requires administrative permissions). 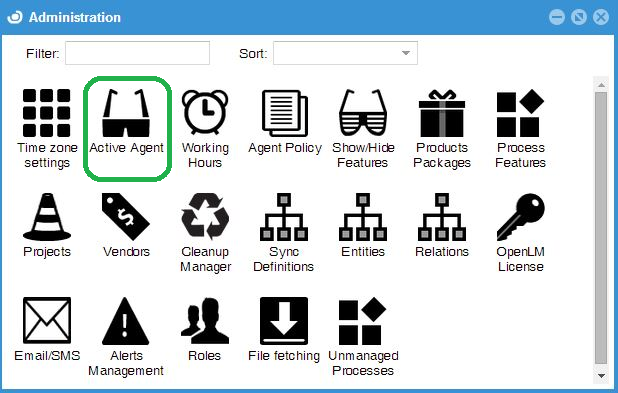 In order to view the users licensing level, right click the OpenLM Agent icon. 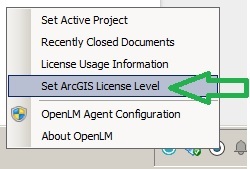 “Set ArcGIS License level” appears in the pop-up menu (Marked by the green arrow). 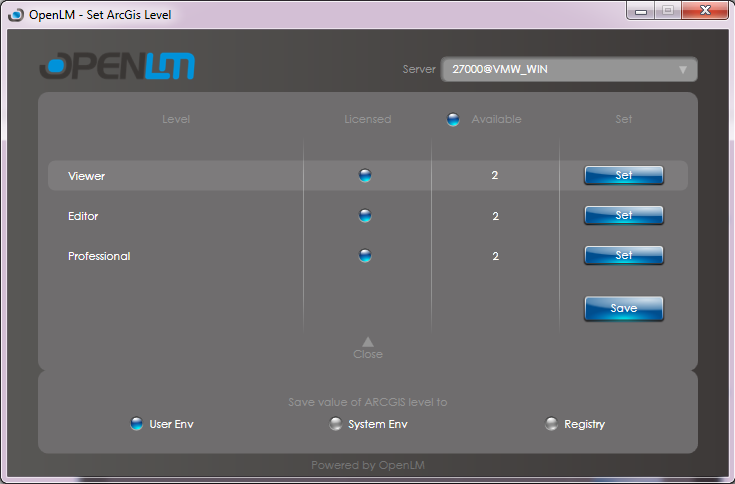 The three levels of licenses appear on screen; each with its availability indication. Registry (Default): Save the licensing level to the local registry. 1. Open the OpenLM Easyadmin tool and press the Easyadmin start button (On the bottom left corner of the Easyadmin window). A selection menu pops up. Checked: The ArcGIS license level GUI is NOT presented to the end user. Unchecked (Default): The ArcGIS license level GUI is presented to the user. The two radio buttons under “Application behavior when extension passes usage” read: “Turn off extension” and “Shut application down”. “Turn off extension”: When the extension license (e.g. 3D Analyst) usage meats the criterion for idle session license retrieval, the extension’s license will be returned to the license pool, and the application’s license (e.g. Viewer) will be maintained. “Shut application down” will literally shut down the application, thus retrieving both licenses. Another issue reported by many ESRI users and license administrators is the fact that extension licenses are kept in a check-out state even after ESRI sessions have ended. The “Turn off licensed extensions at shutdown” option literally takes care to release licensed extensions, so they would not automatically consume extension licenses upon relaunching the ESRI application. The “Turn off custom extensions” option ensures that custom – made extensions that may rely on ESRI licensed extensions will not be checked out upon the launching of the ESRI application, and will not automatically consume extension licenses.